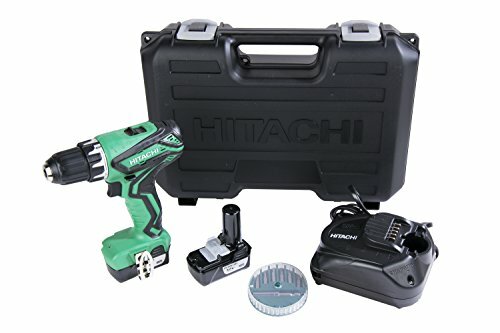 Covered by Hitachi's Lifetime Lithium Ion tool warranty, the DS10DFL2 12-Volt Peak driver drill is impressively compact and lightweight at just 2.1 lbs. With two speed settings and 300 in/lbs of torque, the lightweight design doesn't come at the cost of power. The DS10DFL2 also features a 21+1 stage clutch with 21 torque settings and a drill mode for precision and control. A convenient LED light illuminates dark spaces, and a keyless 3/8" chuck provides simple bit replacements. This driver's small size is ideal for installation, electrical, HVAC and other trade applications, as well as woodworking and fine finish applications. The DS10DFL2 comes standard with two lithium ion batteries for fade free power and lighter weight than that of traditional NiCd batteries. It has all of the power, quality and design that users have come to expect from Hitachi in a compact package.